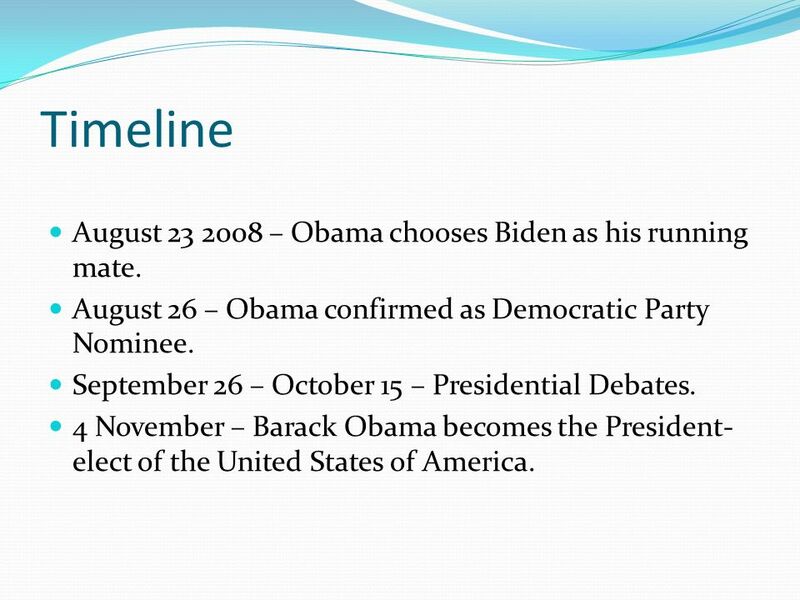 3 Timeline August 23 2008 – Obama chooses Biden as his running mate. August 26 – Obama confirmed as Democratic Party Nominee. September 26 – October 15 – Presidential Debates. 4 November – Barack Obama becomes the President-elect of the United States of America. 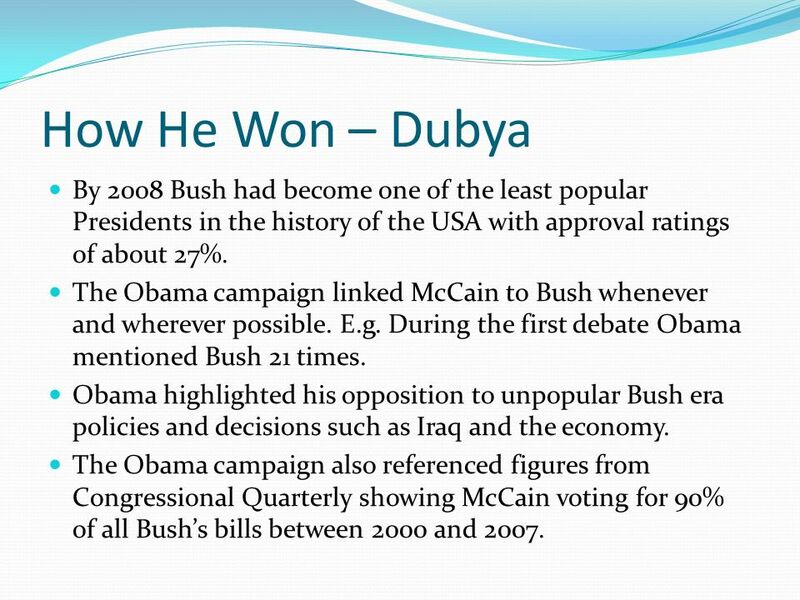 5 How He Won – Dubya By 2008 Bush had become one of the least popular Presidents in the history of the USA with approval ratings of about 27%. 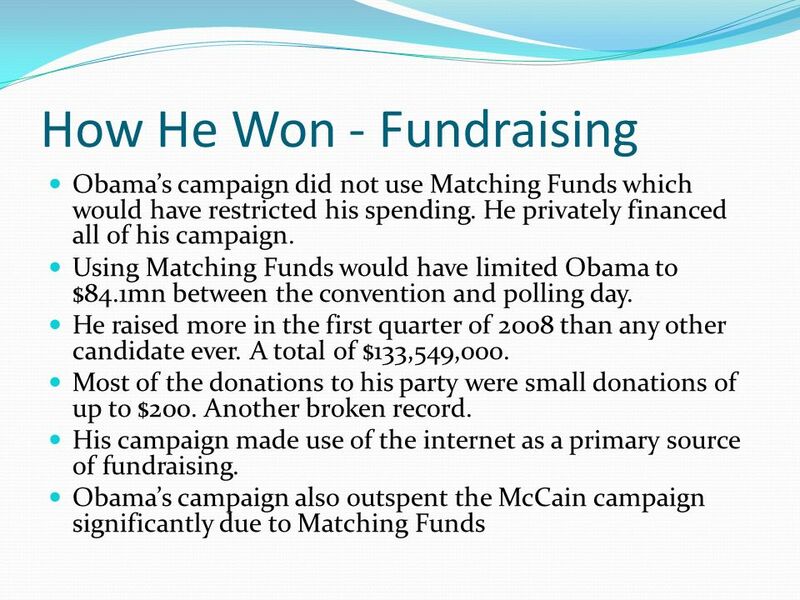 The Obama campaign linked McCain to Bush whenever and wherever possible. E.g. During the first debate Obama mentioned Bush 21 times. Obama highlighted his opposition to unpopular Bush era policies and decisions such as Iraq and the economy. The Obama campaign also referenced figures from Congressional Quarterly showing McCain voting for 90% of all Bush’s bills between 2000 and 2007. Obama’s campaign focused on hope and change as its key themes. E.g. 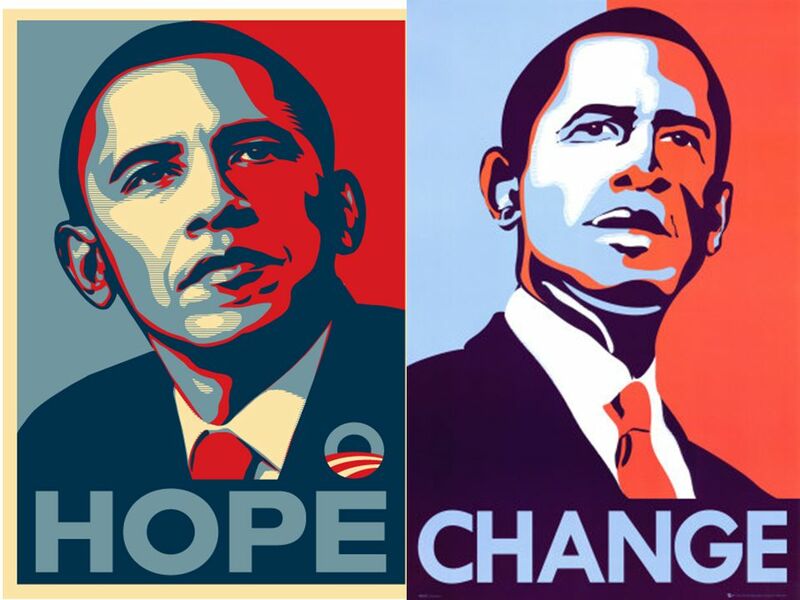 Iconic Obama poster with “Hope” beneath. 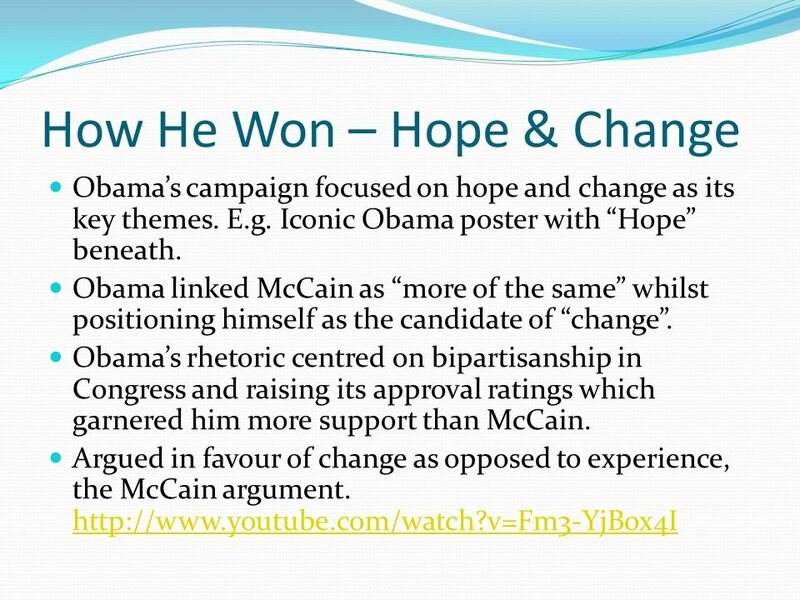 Obama linked McCain as “more of the same” whilst positioning himself as the candidate of “change”. Obama’s rhetoric centred on bipartisanship in Congress and raising its approval ratings which garnered him more support than McCain. Argued in favour of change as opposed to experience, the McCain argument. 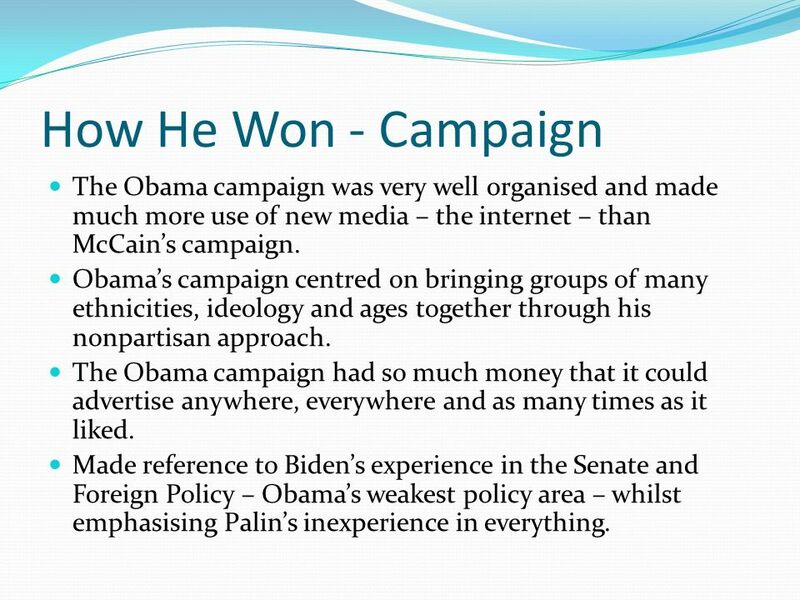 8 How He Won - Campaign The Obama campaign was very well organised and made much more use of new media – the internet – than McCain’s campaign. Obama’s campaign centred on bringing groups of many ethnicities, ideology and ages together through his nonpartisan approach. The Obama campaign had so much money that it could advertise anywhere, everywhere and as many times as it liked. Made reference to Biden’s experience in the Senate and Foreign Policy – Obama’s weakest policy area – whilst emphasising Palin’s inexperience in everything. 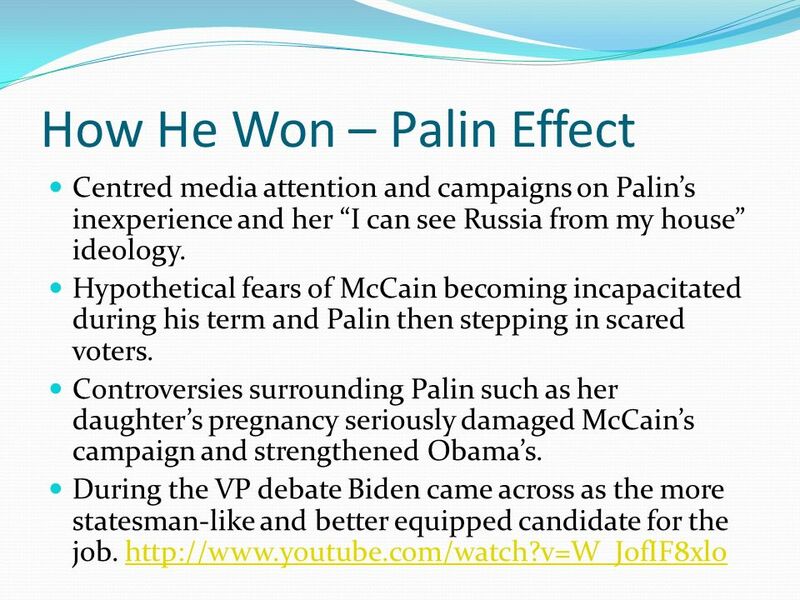 Centred media attention and campaigns on Palin’s inexperience and her “I can see Russia from my house” ideology. Hypothetical fears of McCain becoming incapacitated during his term and Palin then stepping in scared voters. Controversies surrounding Palin such as her daughter’s pregnancy seriously damaged McCain’s campaign and strengthened Obama’s. During the VP debate Biden came across as the more statesman-like and better equipped candidate for the job. Only twice since the Civil War has the electorate voted in a President from the same party as the President who has just completed two terms. Last person to do the above was George H. W. Bush. 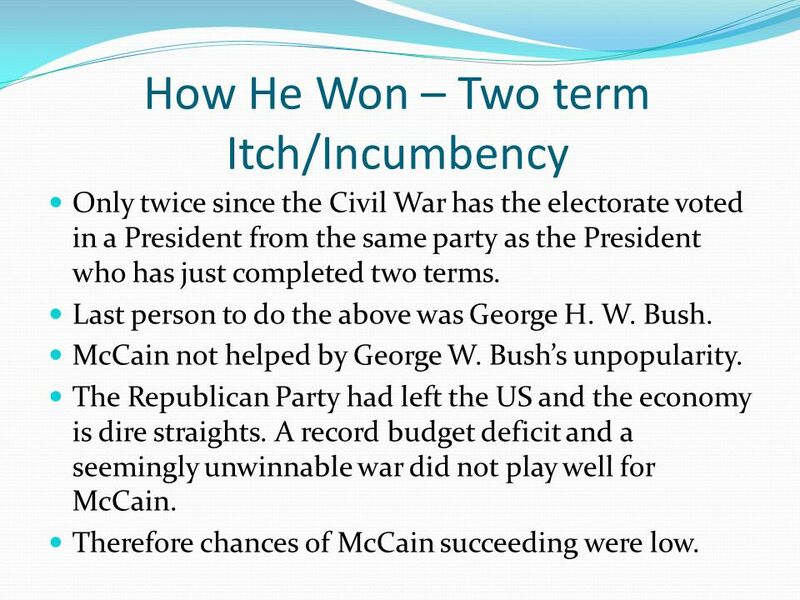 McCain not helped by George W. Bush’s unpopularity. The Republican Party had left the US and the economy is dire straights. A record budget deficit and a seemingly unwinnable war did not play well for McCain. Therefore chances of McCain succeeding were low. 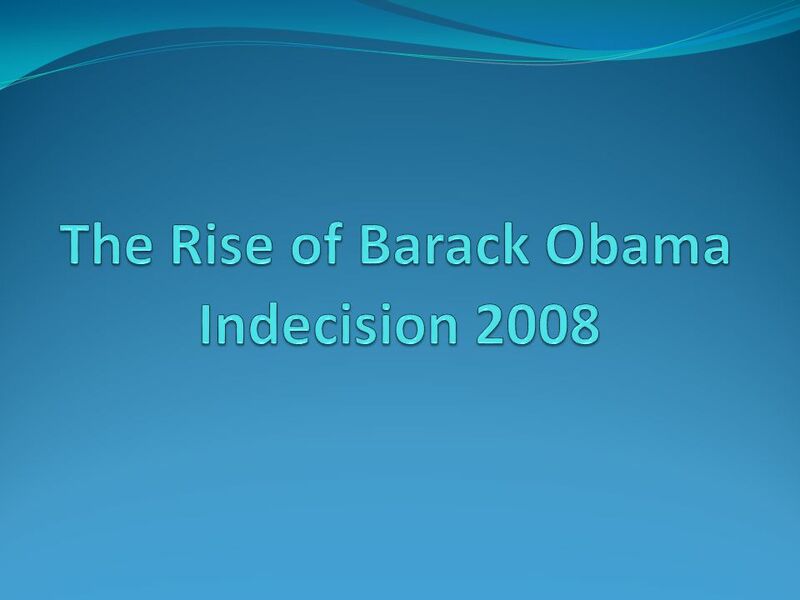 Download ppt "The Rise of Barack Obama"
Cases in Congressional Campaigns: Incumbents Playing Defense Playing Defense in a Year of Change Macrolevel Political Dynamics in 2008.  Kerry is a liberal Democrat, but in this campaign he is running as a reactionary: one who wants to reverse course -- to go back to the attitudes and. The Presidency The Election Process. Qualifications. Barack Obama made history on 4 November 2008 when he defeated Republican rival John McCain to become the first black president of the United States. He. The Presidential Election Cycle in the U.S.A.
2004 Presidential Election Results and Analysis BA 107. President Barack Obama. 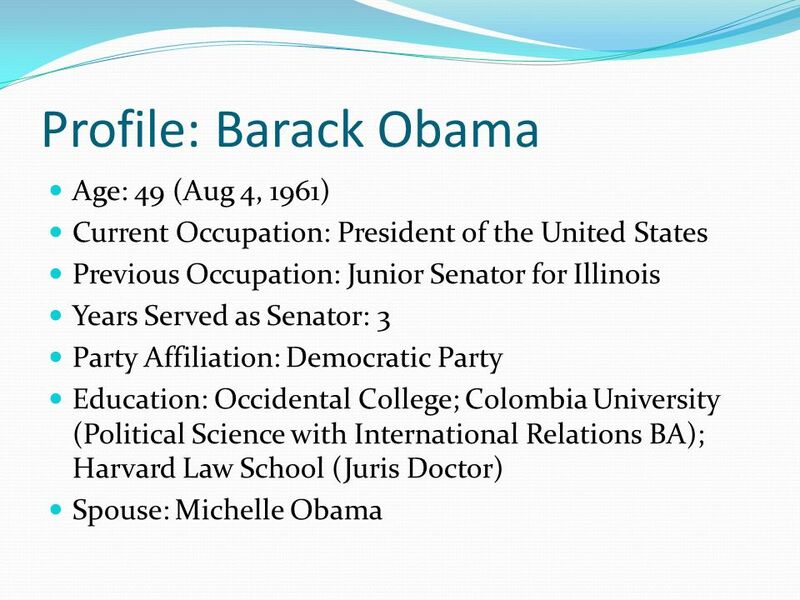 Barack Obama was born on August 4, He was born in Honolulu, Hawaii to his parents Barack Obama Sr. and Ann Dunham. Party Organization National Level State Level Local Level.  starter activity Spot the odd man out. Clue, they nearly all have one thing in common connected with the Whitehouse Jefferson Roosevelt CoolidgeTruman. 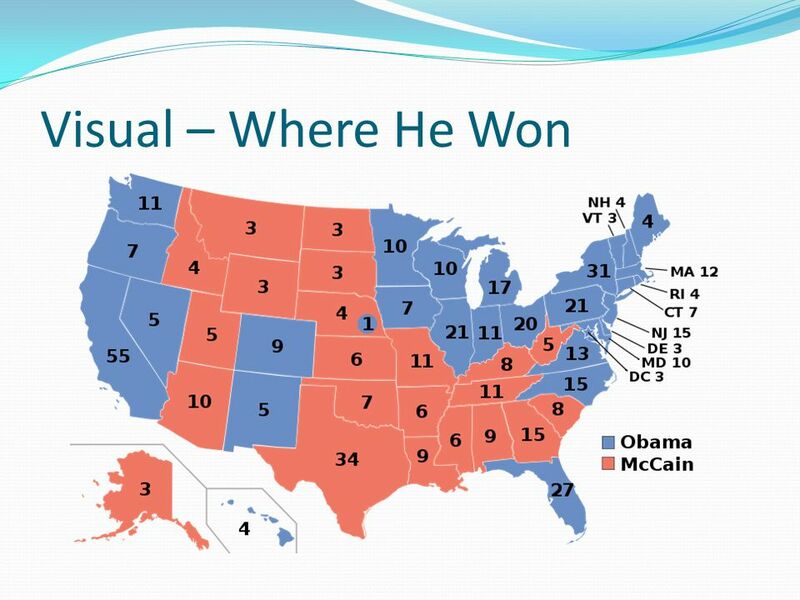 2008 Presidential Election John McCain vs. Barack Obama. Voting 11/9/2011. Clearly Communicated Learning Objectives in Written Form Upon completion of this course, students will be able to: – discuss and critically. 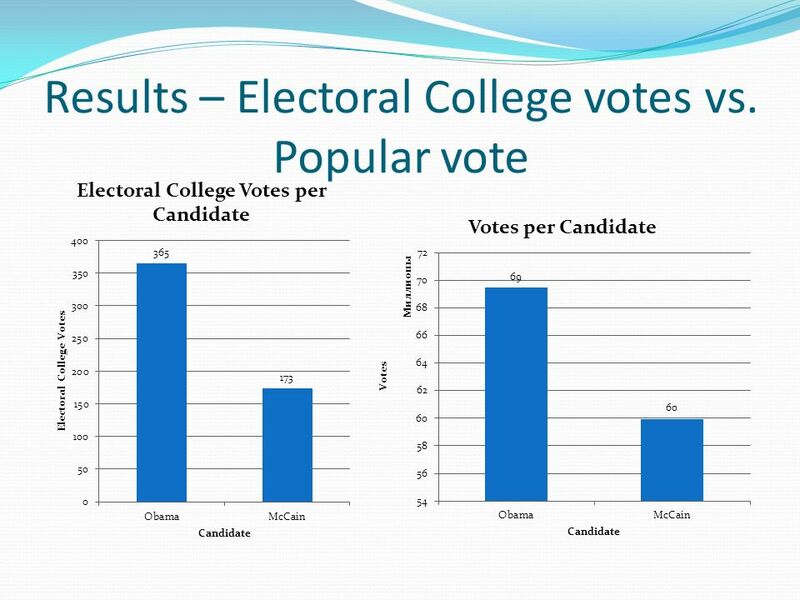 The Electoral College United States of America Presidential Election. Presidential Campaign Financing. 2012 Election Campaigns Republican Mitt Romney vs. Democrat Barack Obama $2.4 billion dollars spent by the campaigns.